How food pantries stigmatize their clients through a discourse that emphasizes hard work, self help, and economic productivity rather than food justice and equity. The United States has one of the highest rates of hunger and food insecurity in the industrialized world, with poor households, single parents, and communities of color disproportionately affected. Food pantries-run by charitable and faith-based organizations-rather than legal entitlements have become a cornerstone of the government's efforts to end hunger. In Feeding the Other, Rebecca de Souza argues that food pantries stigmatize their clients through a discourse that emphasizes hard work, self help, and economic productivity rather than food justice and equity. De Souza describes this "framing, blaming, and shaming" as "neoliberal stigma" that recasts the structural issue of hunger as a problem for the individual hungry person. De Souza shows how neoliberal stigma plays out in practice through a comparative case analysis of two food pantries in Duluth, Minnesota. Doing so, she documents the seldom-acknowledged voices, experiences, and realities of people living with hunger. 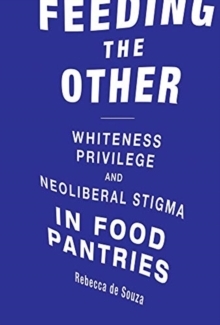 She describes the failure of public institutions to protect citizens from poverty and hunger; the white privilege of pantry volunteers caught between neoliberal narratives and social justice concerns; the evangelical conviction that food assistance should be "a hand up, not a handout"; the culture of suspicion in food pantry spaces; and the constraints on food choice. It is only by rejecting the neoliberal narrative and giving voice to the hungry rather than the privileged, de Souza argues, that food pantries can become agents of food justice.